He use the Boss Loop station just for his solo gigs. In this excerpt from a Dub FX interview, Dub FX discusses why he likes the Boss RC-50 Loop Station Looper Pedal. He originally started with the Akai Headrush pedal as a looper pedal, and a Boss GT-6 guitar pedal for effects, before making the switch to the RC-50. The original interview can be found [here](http://looperpedalreviews.com/exclusive-dubfx-interview/). Shawn used this in his show in Madrid during the song Bring it Back. Sounds so good! The Flecktones website insists that Victor uses the RC-50 loop station. [This](http://www.guitargeek.com/jim-adkins-jimmy-eat-world-2012-guitar-rig-and-gear-setup-diagram/) detailed gear diagram of Jim Adkins' 2012 Jimmy Eat World stage setup includes a Boss RC-50 Loop pedal. In this collection of pedals photo posted by Ekstrom on his Instagram profile, the Boss RC-50 looper can be seen. "Bassist Jason Narducy played a red sparkle Fender Precision Bass passing through a Boss RC-50 Loop Station , a Boss FS-6 dual footswitcher, then a Radial JPC DI." In this photo he posted of his gear setup, Matt Galligan's Boss RC-50 Looper Pedal can be seen. Matt uses a Boss RC-50 Loop Station in this picture. At 0:00 and 0:32 in this official video of the single "Cmon Talk", Bernhoft's Boss RC 50 is clearly visible. "make this work. Not easy"
It can be seen in the first second of this video. At 4:48 in the video, Michael mentions that he has a Boss-RC 50 at home. BeardyMan himslef write, in the video Description: "... My set up in this video consists of: 4x Korg Kaoss Pads (Midi clocked together via a 8 way midi thru unit)1x Boss RC-50 1x Korg Kaossilator 1x Edirol M16DX digital mixer 1x TC Electronic Studio Konnect 48 1x Korg MicroKorg 1x Boss GT8 You love it you slags. www.beardyman.co.uk ..."
He posted a picture of his pedalboard on instagram. In this photo, which shows Wilkenfeld's pedalboard on 2010 Umbria Jazz festival, one of the pedals that can be seen is the Boss RC-50 loop station. In this video Krysztof Scieranski plays through the RC-50 loop station. The video was filmed for the 2010 BOSS Loop Contest. In this video from the Moog sound lab, Moses can be seen using the Rc-50 at 2:15. For those awaiting the arrival of the ultimate looper, the wait is finally over. Introducing the RC-50 — the most feature-laden Loop Station BOSS has ever built. It’s the best live looping tool ever built for that matter. Housed in a spacious seven-footswitch floor unit, the RC-50 lets you manipulate three stereo phrase tracks simultaneously. Each track supports multiple overdubs, so phrases can be stacked one by one on each track, resulting in a monstrous layer of looped phrases. The RC-50 was the best looper of it's kind when it was released, but did not quite hit perfection (the RC-505 hit perfection). 3 phrase loops, some great features, and a looper that has been used joyfully by many a performer, but had some shortcomings that have been almost completely remedied in the 505. I'm intrigued. We're talking loop pedals in the forum. 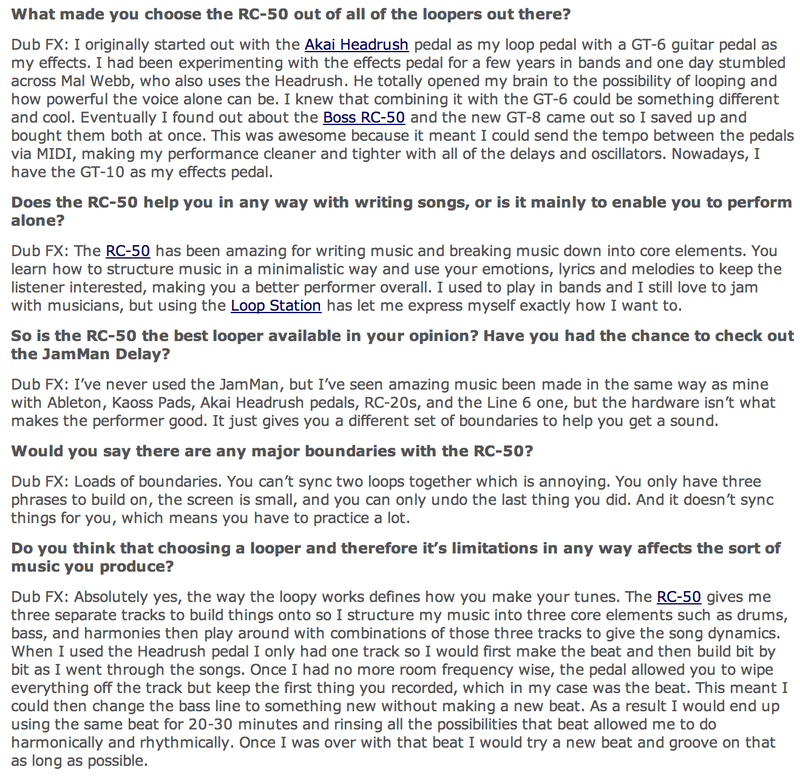 Would love to hear more about what you like and dislike about the RC-50 and RC-505. I use this pedals for almost 8 years. And have zero problem. Just love it!